You'll be £19.99 closer to your next £10.00 credit when you purchase Escape From The Japanese. What's this? Trapped in the depths of Japanese-held territory, it was rare for Allied prisoners of war to attempt escape. There was little chance of making contact with anti-guerrilla or underground organisations and no possibility of Europeans blending in with the local Asian populations. Failure, and recapture, meant execution. This was what Lieutenant Commander R.B. Goodwin faced when he decided to escape from the Shamsuipo PoW Camp in Kowloon, Hong Kong in July 1944 after three years of internment. With no maps and no knowledge of the country or the language, Lieutenant Commander Goodwin set out across enemy territory and war-torn China. Because of the colour of his skin he had to travel during the hours of darkness for much of what was an 870-mile journey to reach British India. Few of his fellow prisoners gave him any chance of succeeding, yet, little more than three months later, he was being transported to the safety of Calcutta. For his daring and determination Lieutenant Commander Goodwin was awarded the Order of the British Empire. 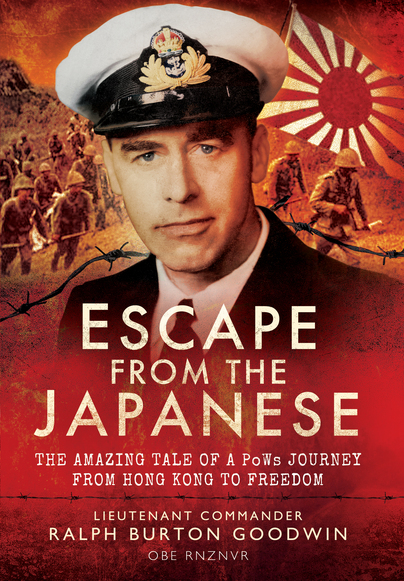 This is a truly fascinating read, with three separate areas of interest - an account of the terrible conditions within the POW camps at Hong Kong, the escape itself and finally the journey across China - and provides some valuable insights into the war in China. A tale of human endurance and ingenuity plus a vivid description of the countries he traveled through until reunited with his family in New Zealand.